Tourist woman runs down the street in Rome, Italy, takes pictures of Colosseum. Girl looks at the photos. Slow motion. 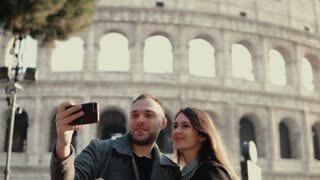 Woman walks down the street in Rome, Italy, takes photos of Colosseum, arch of Constantine with smartphone. Slow motion. 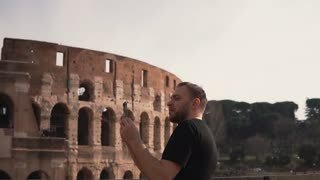 Woman tourist runs on steps in Rome, Italy and take pictures of Colosseum, Konstantin s arch on smartphone. Slow motion. Tourist brunette woman takes photos of arch of Constantine and the Colosseum withsmartphone in Rome, Italy. Slow motion. Tourist woman takes photos of the Colosseum and the arch of Constantine with her smartphone in Rome, Italy. Slow motion.